Life seems to be on an egg-timer these days. Besides, it feels like most of the population is on vacation so we’ll spin the wheel and do a quick flower pick of the day – Monarda. 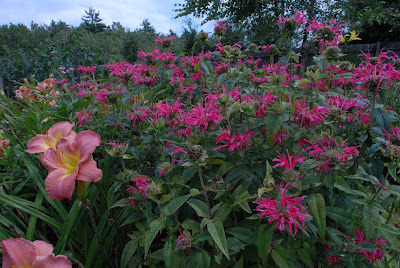 This genus, which is more commonly known as Bee Balm is a member of the mint family. You know when you pass Monarda. It is fragrant but don’t think roses. A tad more pungent, it is a good choice to keep the deer in check but attracts hummingbirds and butterflies. There are some great varieties to choose from but I always have a particular favorite. My pick is ‘Coral Reef’. Known for its bright, punchy color and compact growing habits, it is a tad more tolerant to powdery mildew, which can be problematic to Monarda. Looking for some mid to late summer beach colors to find their way into your garden? Check out ‘Coral Reef’. It does stay a bit more behaved than the standard Monarda but if you give anything the optimum growing conditions, you may find a larger quantity than you originally anticipated. Give even this compact variety some elbow room and keep it in check if you aren’t looking for volunteers.